After a week of tummy aches and sleepless nights, I had a moment of parental bliss this afternoon. Both MG and McB wiped out during a long, lingering walk. Ahhh, success! Tim's played drums with the Evensong band for years and 2 weeks ago our friend Chris (the band leader & pastor extraordinaire) invited us down as part of a team that's starting a church in the heart of downtown. We're hoping to create a place where the urban poor, university students, professionals, families, etc can all worship together. Much like the Brainerd Mission way back in the early 1800's (I'll fill you in on that story another day, it's pretty cool stuff). I'll be "Director of the Creative Arts" (sounds very official, huh?) and my job will be to partner with local artists to make the arts accessible for all, regardless of money or ability. I'm really hoping to encourage the creative spirit in folks through classes and workshops of all sorts - painting, sewing, knitting, screen printing, pottery... oo, and I'll also be the in-house graphic designer. I can't wait! 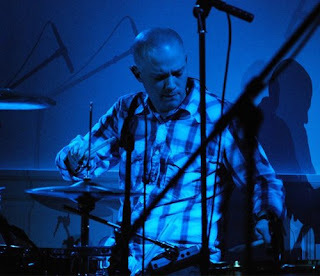 Tim will continue to play with the band and for the first 5 months he'll help overhaul the building. It's located right on restaurant row and will have a coffee shop and arts space downstairs, as well as a state-of-the-art recording studio and sanctuary upstairs. It's been a quick decision process, but we're thrilled to be a part of it. 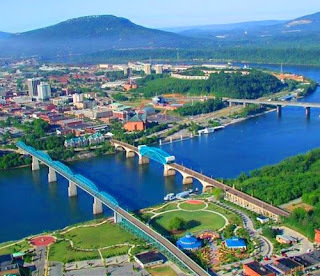 I've never been to Chattanooga, but I've heard it's quite pretty, very artsy, the people are friendly and there's lots to do outdoors. So if any of you feel like a move or a visit, all are welcome to come say "yoohoo" to the "Choo Choo"! Last Friday on my way to the building supply warehouse I stopped for a snack. Truthfully, I was horribly lost and looking for some solid directional advice and a bit of sweet comfort. This shouldn't be a shocker to any of you that know me! Anyway, I figured a Twix would be great, but this bottle caught my attention... It may not be the prettiest thing you've ever laid eyes on, but man is it interesting! 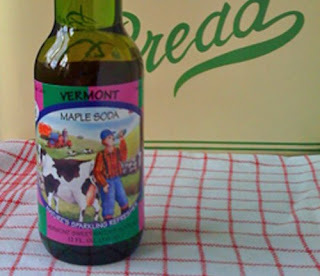 Vermont Maple Soda. Yup, that's right! Of course I bought it (even though I'm not a big soda fan) and gave it a try as soon as I had a few folks lined as guinea pigs. Believe it or not, it was surprisingly tasty. Not too sweet and vaguely smoky. Kind of like being in a cabin in the woods after a long day of snowboarding. Now that's happiness in a bottle! As you know, I'm a huge fan of brilliant design. Especially when it makes my life easier and prettier! 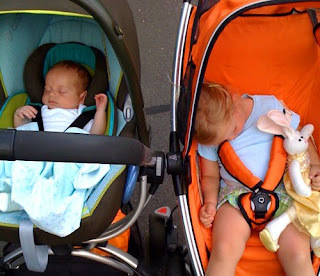 So when I spied a Quinny Zapp stroller on mega sale last week, I knew it was time to splurge... having a gift certificate to the store was a great justifier as well. Before you think I'm pushing a product, let me explain why it's my new favorite baby essential. 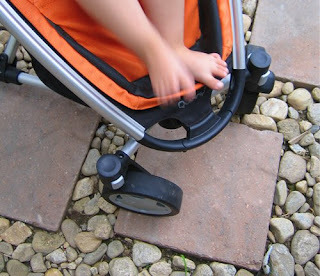 It's the world's smallest stroller AND it's super easy to fold. With 2 kids, a purse & no brain that's huge! 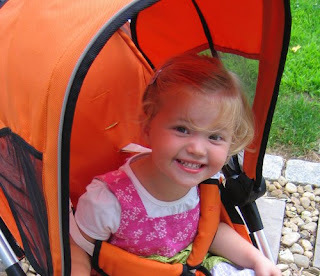 Plus it happily teams up with McB's MaxiCosi car seat. Ahhh, I love it when great design delivers on the promise! Oo and before I forget... if any of you have some hot tips, please share. I'm always on the hunt for fun, happy goodies to feature. Thanks! Ever hear the latest hot tip and realize you're the last to know? Well, I had a super slow moment last week with this one. So slow, that it's officially a "cold tip" by now! Anyway I figured that maybe, just maybe I'm not the very last to know and that I'd share with my fellow slowbies. 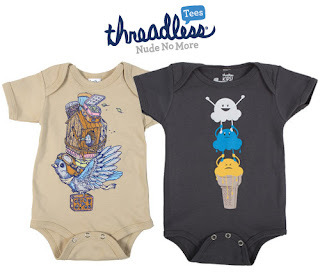 Here it is - Threadless.com. It's a community-based tee company that welcomes artists to submit design ideas. So the shirts are super fun, very hip and limited editions. 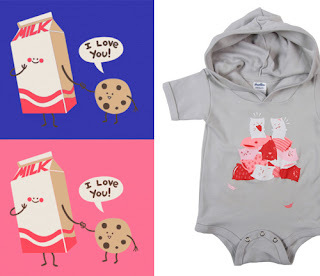 They have all sizes from baby through adult including the cutest onesie hoodies. Trust me when I say they're amazing, plus they have five dollar deals all the time. Yay for supporting artists and being thrifty. I can't wait to choose some for McB and MG! One of my all time favorite colors is pool blue. 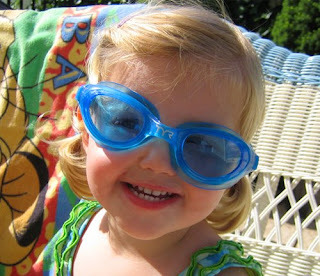 I mean really, is there anything better than a bright, sparkling blue pool on a hot day? Ahh. So for the past few days I've been bravely sporting my bathing suit (not the cutest sight at the moment) and we've set up shop at my parent's pool. MG splish splashes a ton, McB naps and I cruise along. It doesn't get much better than that in life. With all that in mind, I made McB a taggie blankie. For those of you that sew, this is the best little project to make cause it's an excuse to use all the fun little bits of fabric and ribbon that you've been saving. 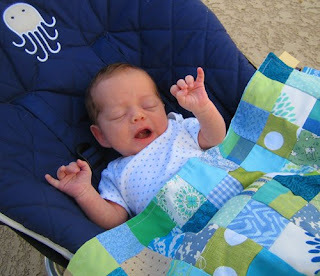 Plus it's a quick, fun baby gift that's easily personalized. Just cut the fabric into 2.5 inch squares (I used a bunch of my fav vintage scraps) and the ribbon into 6 inch strips. 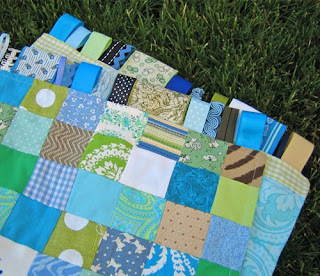 Sew the squares together until it's the size you'd like - McB's is 14 x 20 inches so that it fits over him nicely in the car seat. Once the top is done, fold the ribbons in half and pin along the edge. Sew in place. Cut a piece of fabric the same size as the front, pin right sides together and sew. *Remember to leave a hole for flipping it right sides out (like a pillow case). Flip, pin the hole together and top stitch the edge to finish. Ta-da! Ooo, I have a new candy find ... and it'll make you feel a bit tingly inside. For those of you that are a product of the eighties like me, you probably can't help but have happy memories of Pop Rocks. Well my friends, prepare to be amazed. The Pop Rock has been upgraded! Wonka has covered then in chocolate (no, that's not a typo) and marketed them as "Tinglerz". YES! Seriously, I'm never one to turn down anything chocolate coated and these delivered bigtime. MG and I had a blast eating them, though I didn't have the science background to answer her "how'd they do that question". What can I say? I'm simply in it for the chocolate!